I support the Duterte Administration, but I criticize it when criticism is due, so here I go. Presidential Communications Office (PCO) Assistant Secretary (ASec.) Ana Marie Banaag held a conference earlier today to explain President Rodrigo Duterte’s memorandum realting to the declaration of a State of Lawless Violence in the country. Banaag read a memorandum signed by Executive Secretary Salvador Medialdea. (1) when the person to be arrested has committed, is actually committing, or is attempting to commit an offense in the presence of the arresting officer. (2) when an offense has just been committed and an arresting officer has personal knowledge of facts indicating that the person to be arrested has committed the offense. (3) when the person to be arrested is a prisoner who has escaped from a penal establishment or place where he is serving final judgment or temporarily confined where his case is pending. (4) when the person arrested, or to be arrested, has voluntarily waived his right against warrantless arrest. After reading the entire statement, Banaag accepted follow-up questions from the media corps. The first question was from Leila Salaveria from the Philippine Daily Inquirer. Presidential Communications (Government of the Philippines) ASec. 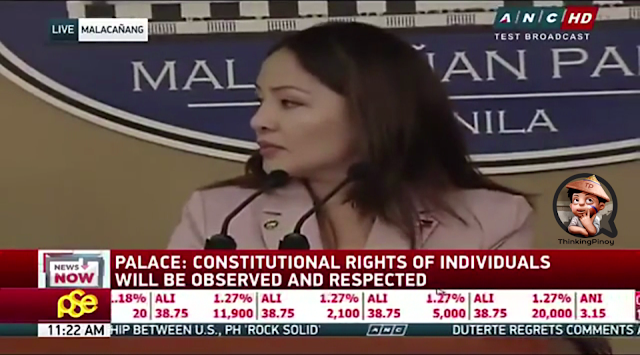 Ana Marie Banaag, the Revised Penal Code is not the actual basis for warrantless arrests. The constitution is the supreme law of the land, but it’s incorrect to cite the constitution out of the blue. Why? Because many provisions in the constitution include the phrase “as defined by law” or “as provided by law”. This means that the provision require the enactment of an addition “enabling law” before it takes real-life effect. The constitution prohibits political dynasties but political dynasties abound. Why? Because there is yet to be an enabling law for this constitutional provision. Banaag should have simply skipped citing the constitution and went straight to citing a specific Republic Act or Court Rule. And she actually did, but there’s another problem. Aside from citing the constitution, Banaag also said warrantless arrests are based on the Revised Penal Code, otherwise known as Republic Act 3815. There's a problem with this statement: the Revised Penal Code, while allowing for warrantless arrests, does NOT provide the specific exceptions to the prohibition on warrantless arrests. Art. 269. Unlawful arrest. — The penalty of arresto mayor and a fine not exceeding 500 pesos shall be imposed upon any person who, in any case other than those authorized by law, or without reasonable ground therefor, shall arrest or detain another for the purpose of delivering him to the proper authorities.chanrobles virtual law library [RPC Art. 269]. Art. 269 states there may be exceptions to the requirement of arrest warrants, but it does not actually say what those provisions are. RPC is correct, but it's not the best answer. Revised Rules on Criminal Procedure? Yes. Is there really a law or rule that allows warrantless arrests? Yes. This is pretty much the same words included in the memorandum, except that Sec. Medialdea’s memo didn’t mention the name of the law upon which the statements were based. In short, it’s not the Revised Penal Code. Instead, it’s the Revised Rules on Criminal Procedure, Rule 133, Section 5. So Banaag cited the wrong law, but does this issue really matter? First, members of the opposition love to point out even the most trivial flaws in the Duterte Administration, so it’s essential to not give them additional ammunition. Second, policemen and other law enforcement authorities may use Banaag’s inaccurate statement to justify warrantless arrests. We do not want these brave men to look stupid, of course. Third, public confidence in the government’s competence is essential in any successful state. In the case of the Presidential Communications Office, it’s their job to be as accurate as possible when conveying the president’s messages.